Named for its 17th- to early 20th-century owners, the Salvin Hours is one of the largest and most richly decorated English books of hours. Its decoration, created by two artists, resembles contemporary wall paintings in the Oxford area, suggesting that it was made in a workshop there. Its original owner probably was a high-status person living in Lincoln because it also resembles 13th-century books of hours associated with that city. It lacks a calendar, which would have helped to locate its original place of use because it would have listed saints' feasts special to a particular place. This page gives prayers for terce (9 am) in the Hours of the Holy Spirit, a set of meditations included in some English 13th-century manuscripts. 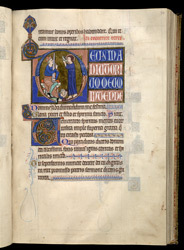 In place of the scenes from the life of Christ that it gives the Hours of the Virgin, events from the lives of saints are depicted. The first letter for terce bears a scene from the life of St John, as told in medieval books of saints' lives such as the 'Golden Legend' of Jacobus de Voragine. While preaching in Asia, John encountered pagans whose high priest, Aristodemus, promised wholesale conversion if John could survive drinking poison. First Aristodemus tested the poison on two prisoners, who are lying dead in the scene. John not only survived the poison but also restored the dead men to life. The story has nothing to do with the text of the prayer. The picture is meant to present an example of faith to imitate.